Not a whole lot….I came straight to MLML after graduating from UC Davis, though the internships and volunteer work I did as an undergrad definitely gave me a taste for what grad school would be like. A: I’ve always wanted to go to vet school. Then, as an undergraduate, I got SCUBA certified and fell in love with the ocean. I started taking classes on ocean-dwelling organisms, and spent increasing amounts of time in and around the sea. I also started gaining insight into other people’s perceptions about the ocean, and realized that, for many people, there is a great disconnect between their own actions and impacts on the environment. It was when this realization sunk in that I committed myself to studying marine science so I could bridge that gap and start changing people’s actions and perceptions about the ocean. A: I fell in love with marine science after getting SCUBA certified and studying abroad in Australia as an undergrad. I cemented my commitment to studying marine science by doing a dolphin behavior internship in Sarasota, FL, and volunteering for several research projects. My volunteer work took me to the Florida Keys to study Caribbean Wrasse, and to northern California to study abalone density and distribution. I also continued to pursue diving by taking more classes and making it a priority to dive regularly. 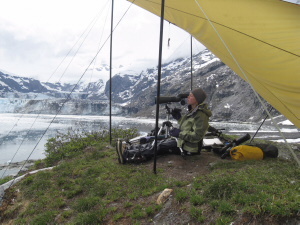 A: I’m studying the impact that vessels have on harbor seals in Glacier Bay National Park, Alaska. To me, it’s important that we study the effects of anthropogenic (human-caused) stressors on wildlife in order to minimize negative physiological and behavioral impacts. Since humans tend to encroach on critical ecosystems, I feel that it is our duty to quantify and minimize our impact. A: I would love to work as a wildlife biologist doing field research and wildlife management, but ultimately I want to teach. Although I can see myself teaching in a formal classroom setting, I would rather work in outreach and education at a zoo, aquarium, or reserve, educating the general public about how their actions have large impacts on the environment around them, and how they can change their lifestyles to have a positive effect on the ocean. A: One of grad school’s greatest challenges for me has been the frustration of coming up with questions that don’t have a correct or known answer. For example, when developing the sampling protocol for my thesis project, it was frustrating not knowing which sampling methods would best answer my questions. I guess that’s where trial and error comes in. That being said, one of the most rewarding aspects of graduate school is coming up with solutions to those frustrating problems. Much of the time this comes after spending many grueling hours in the field doing pilot studies, but in the end, when the data is collected, and you employed a good sampling technique (or at least you think you did), it’s soooooo satisfying. A: Do internships and volunteer work!!! You won’t know whether marine science is the right field for you unless you get your feet wet. Also, start networking early. Going to conferences (Western Society of Naturalists is a great one to start with because it’s so low key), volunteering in labs or with graduate research, and getting to know your professors is a great way to start making connections. Remember: It’s not who you know….it’s who knows you.